In Warrior Dash curator Fran Holstrom pairs the paintings and sculptures of Jamison Brosseau and JR Larson, a cohesive combination that raises questions about just what primitivism is and what it means to be an academically trained artist working with such references in the twenty first century. 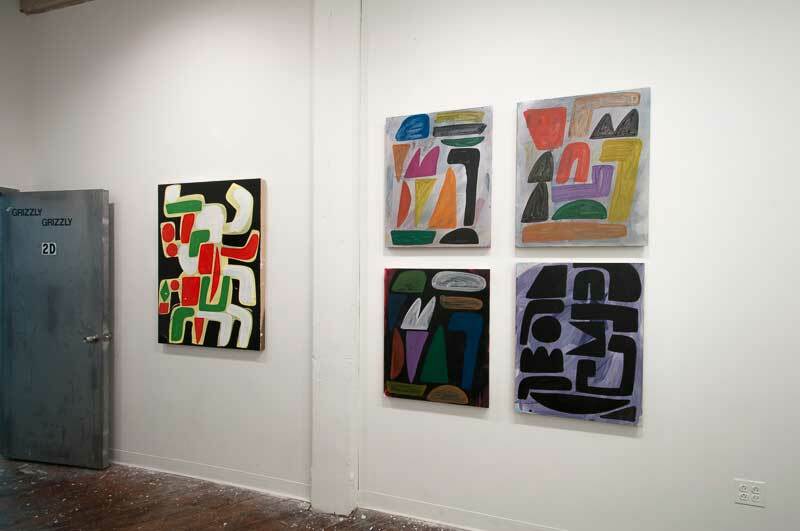 Brosseau’s clunky paintings pack irregular geometric forms tightly against one another, leaving a brush’s width between every wobbly “L” shape and bulbous triangle. Each is an inventory of sorts, organizing form with cramped, artless economy (think of tools hanging from pegboard). Color is applied straightforwardly with intentionally casual brushstrokes, the drab neutrals of black and off-white backgrounds showing through transparent magentas, yellows, and carmines. The lack of conventional balance in form and color is the appeal of this work, the edges of each painting acting as firm boundaries beyond which no colored block may pass. Yellow Christmas Spider stands apart from his working methods elsewhere, the geometric forms combining into a thick, abstracted hydra. 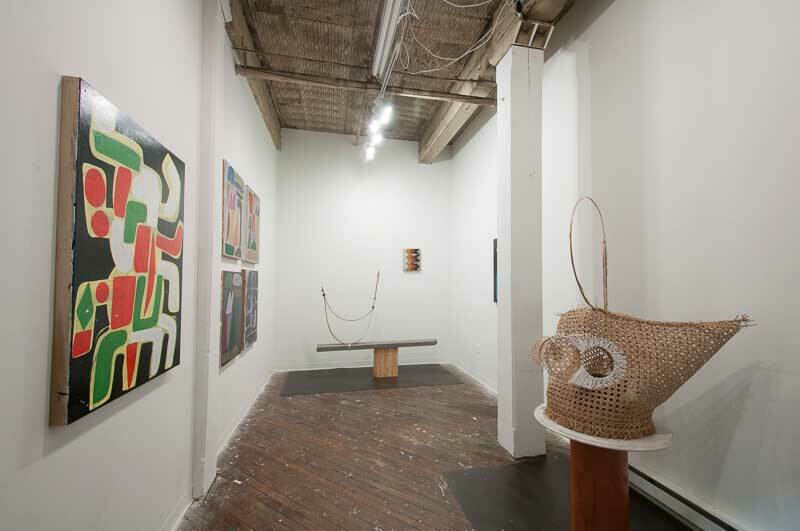 In contrast to Brosseau’s chunky abstraction, JR Larson’s sculptures and pierced paintings are quiet but tense. Materials such as intestine, wood, caning, and calcium pull, bend, and sag like ambiguous artifacts from a scrambled museum of Native American art and artifacts. Double Bow has the folksy specificity of a hunting bow; Oculus could be the neglected ceremonial mask of a giant. In the two painted works, bone-like needles pierce the surface of canvases striped with earth tones reminiscent of Pueblo and Hopi patterns. 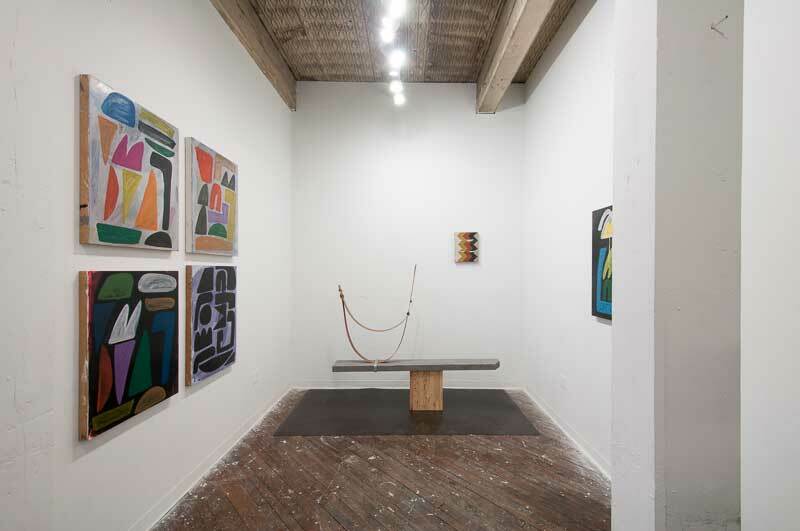 Together the two artists’ works are complements in temperament, with Brosseau’s heavy vigor in appealing opposition to Larson’s quiet tension. 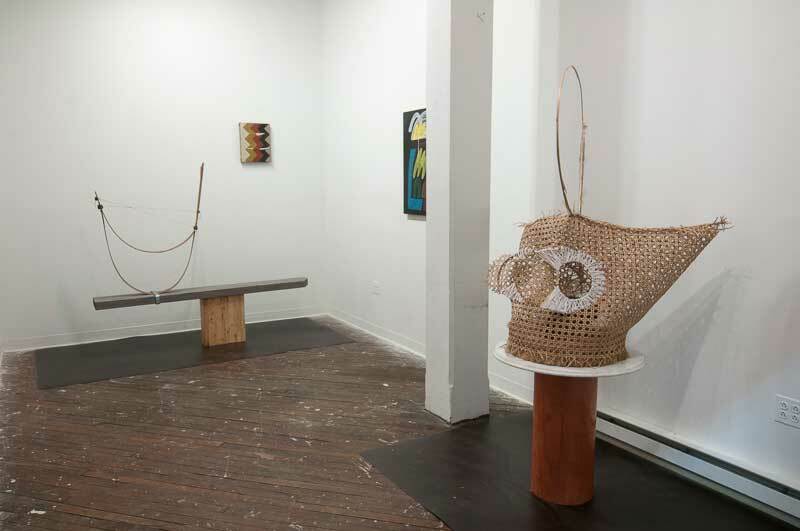 Yet the two have much in common in the historical references that inform their work, which lay outside of the traditional Western concerns of form, balance, and ingenuity-in-technique. Since Gauguin’s trip to Tahiti (and probably before), artists in the Western cannon have deliberately rebelled against these concerns, looking to primitive (in the language of the 19th century) cultures for more direct expressions of the human body and spirituality. The appropriation of indigenous and prehistoric cultural forms by western artists, much criticized in post-colonial theory, has become so enmeshed with the history of western art that artists rarely acknowledge its outside influence, because it has been on the inside for so long. The current echoes of primitivism are as much the progeny of contemporary artists such as AR Penck and Don Van Vliet, as they are from the handicraft and pattern of traditional cultures. In Brosseau’s and Larson’s practices, this may point to the dilemma of their working methods. Their potential pitfall is the self-consciousness, not disingenuousness, of knowing all too well the historical rebellions of western art against its own canon while still trying to get a piece of authentic wildness, too. Jacob Feige is an artist and teacher. His work has recently been shown at Chambers FA, Beijing, Movement, UK, and Jolie Laide, Philadelphia.